The print quality test pages can be used to diagnose several print quality issues. You may be asked to perform this test by tech support. 1. On the printer's control panel, set the default source to Tray 1. Press Menu - Select Paper Menu - Select Default Source - Select Tray 1. 2. Open the fuser door to disengage the feeder path switch so the paper feeds out the top of the printer. 3. Turn off the printer. 4. 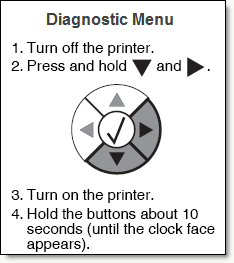 Access the diagnostic menu by holding the Right and Bottom arrow buttons on the control panel while switching on the unit. 5. Select the Print Tests Menu - Select "Prt Quality Pgs". 6. The quality pages will print out of the top of the printer. 7. Restart the printer. Close the fuser door. Reset the default source to MP Feeder.